Jive Inc., a leading social enterprise software provider, has launched a mobile version of their popular Jive application so that all companies and all employee types can take advantage of the collaboration Jive offers. Now mobile employees such as regional sales representatives can stay in touch with the “mothership” and include their input on discussions, polls, and the like. Android 4.0 + This includes Android 4.0 and above for smartphones, tablets, and TVs. Apple iOS 7 + This includes the iPhone 4 and newer, iPad 3rd generation and newer (iPad Air, iPad Mini), and iPod Touch 5th generation and newer. Windows Phone is sadly not supported at this time but news of a Windows Phone Jive app has been released with the expected delivery date of August 2015. If you are using a mobile Apple product such as an iPhone, iPad, or iPod Touch, you can download and install the application in two different ways. 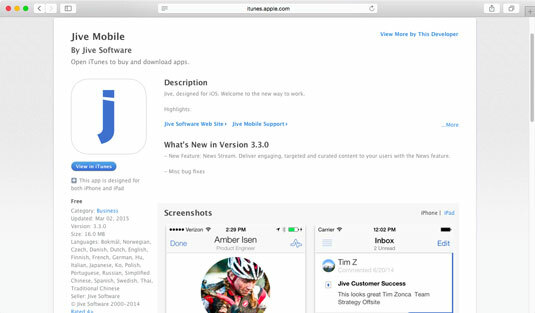 Simply launch the App Store, perform a search for Jive, and tap the Get button. Launch the iTunes store and perform your jive search here, locate the correct application and again click on the Get button. With both scenarios you are asked to enter your credentials to continue. Provide the correct information, and the app installs. If you are using an Android 4.0 + device, you too have two different ways to download the application. Locate and launch the Google Play Store from your device, perform a search for Jive, and tap the install button. From your computer’s web browser, go to the Google Play Store website. Perform the same Jive search and when you’ve located the app, click Install. A list of all your Android devices appears. Select the device you want to install the application on and click OK. When the Windows Phone Jive application launches, you follow the same steps. 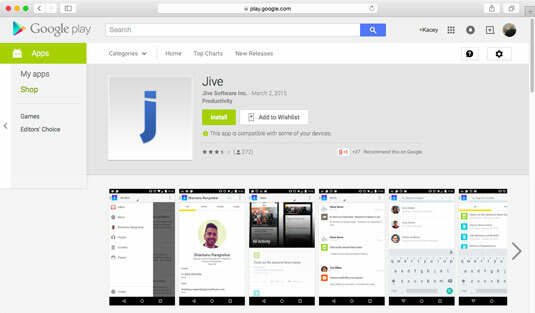 Launch the Windows App Store and perform a search for Jive or Jive Mobile. Locate the application and tap install. This is a free mobile application, however, since you need a Jive account to login and access the application, you will not be able to use it until the computer software has been purchased and configured for your company or business. Since Jive Mobile is essentially the same as its desktop sister software, using the application is the same as well. You can post discussions, comments, photos, polls, and videos right from your mobile device. Simply launch the application, login to your Jive account, and tap the corresponding heading to start Jive-ing!